Sometimes when you are blogging you can feel like you are living a lie. There is a life that I share with you through my blog and then there is the private life that I share with my nearest and dearest. Just recently I haven’t been sharing the whole truth with anyone. As my regular readers will know Mr Myasthenia Kid and I have been through some pretty traumatic times of late. We lost one of our beloved dogs just before Christmas, then my Grandmother passed away, then my dear friend Pam passed away and then a school friend passed away. At the time it felt like I was just coming up to the surface to catch my breath and something else happened. There was no time to process anything at all. I knew that it was affecting me as there were days where all I would do was cry but I also knew it was having other effects on my mental health. I have always been a really anxious person, I have spent years in therapy learning how to do CBT. The problem this time was no matter how rationally and logically I could see what I was getting anxious about was ridiculous, I still ended up diving down the rabbit hole. I was waking from what little broken sleep I was getting in a state of absolute panic – usually clueless as to what had set it off. My anxiety was reaching proportions I had never experienced before. I felt constantly as if I was in flight or flight mode, all the time pretending to everyone around me I was ok. I didn’t see the point of bringing up my anxiety because I knew it was irrational and there was nothing for Mr Myasthenia Kid to fix. I just thought I would try to soldier on. At some point it had to get better right? I tried bringing up my anxiety with my hospital consultant. I explained to him what had been going on and he responded “well it’s early days, give it a few more weeks and see how you feel”. The problem was he didn’t realise that if I am bothering to bring something up in an appointment it has got to the point where I can’t cope with whatever the issue is anymore. I don’t bring up all the different things that are wrong at every appointment, as we’d be there all day. I only bring up the most pertinent issues. If I am bringing up anxiety, it’s a big issue. Especially with my previous issues with mental health which are almost 20 years ago now. Although the hospital consultant never meant for me to take it this way, I am sure, I felt like he told me to pull myself together and stop making a fuss. So I continued to solder on, with the trip to Birmingham only a week away I knew I had to hold it together. My anxiety was going crazy, I was barely sleeping but I just had to keep going because it would settle down, it would get better. The problem was it was just getting worse. I wasn’t sleeping and every waking hour was filled with fear over the slightest thing. I had permanent butterflies and I was close to tears constantly. Anything at all was making me burst into tears, which wasn’t me. Last week it all came to a head. On Monday after my fall I kept bursting into tears. Initially I put it down to banging my head and the stress of the boiler not working. However as the days went on I was still crying at the drop of a hat. I had to face facts that things were not settling down, I was feeling worse than ever. Jay had noticed that I had become incredibly quiet and continually distracted (staring off into space), to the outside world it was still business as usual but even that was becoming hard to do. I am a great pretender but I was even beginning to struggle coping with the outside world. I had started to withdraw from my friends and just hadn’t bothered to message them as I just couldn’t cope with the thought of having to maintain a conversation and pretend that I was ok. I managed to get the Duty Doctor to ring me as all appointments until after Easter had been booked. When the receptionist asked what was wrong and I replied anxiety and depression, she immediately put me on the duty doctors call list. I am eternally grateful that she didn’t think that I could wait for a standard appointment. I wasn’t at risk of doing anything stupid, I wasn’t feeling suicidal, I just felt like I couldn’t cope with everyday life. The doctor rang me back in a few hours and I explained what had been going on. She was so kind and understanding, she didn’t make me feel like I was overreacting and that I should be able to cope. She told me most people struggle with one bereavement to suffer so many in such a short amount of time would knock anyone. I was prescribed diazepam to use on the days when the anxiety was at its worst, when I just couldn’t calm down. To help me sleep she doubled my dose of mirtazapine. I am slowly starting to feel a lot better, I seem to have had a break in the constant feeling of panic that I couldn’t stop before. I am still anxious but its at a more normal level. I am however exhausted constantly, my sleep is still hit and miss. Some nights I am out like a light but others I am still wide awake hours after taking my meds. I am also feeling very groggy the following morning and it’s taking me a bit of time to wake up. All of which I can live with if it continues to improve my level of anxiety as I don’t want to end up with the situation where the anxiety eventually causes me to become depressed. 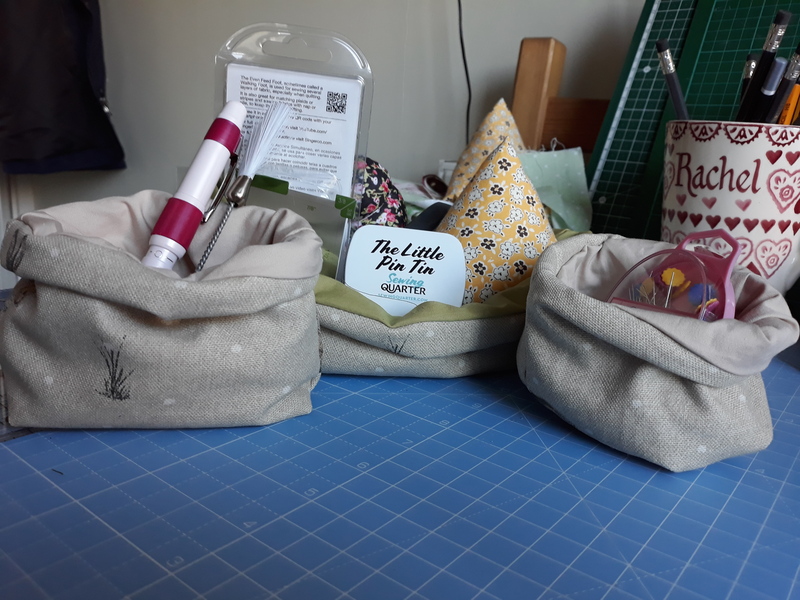 So that you can appreciate how bad things had become I had got to the point where I had become frightened of using my sewing machine. 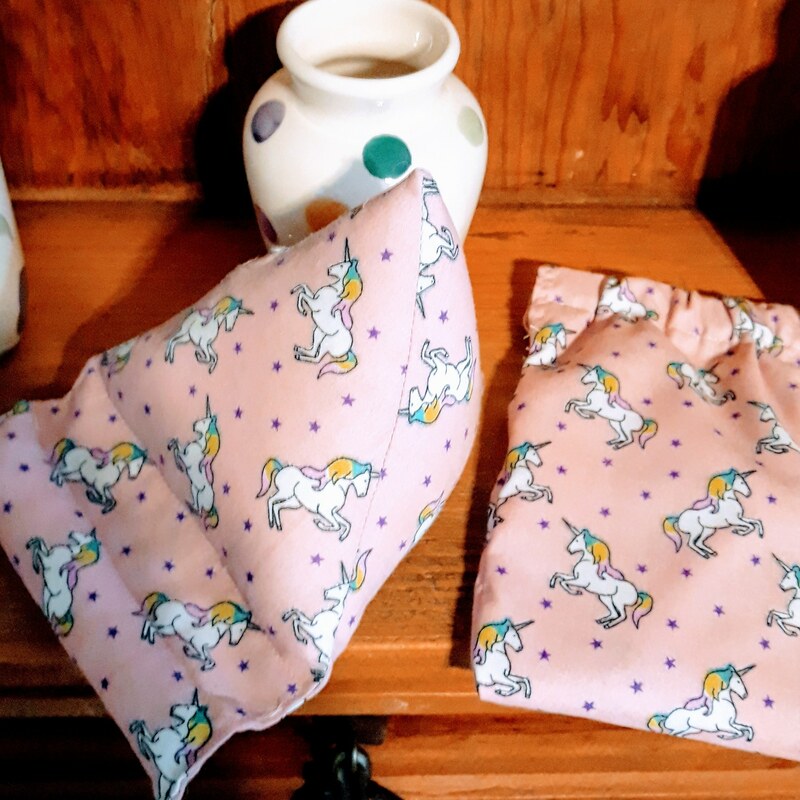 Now anyone who reads this blog or knows me in real life knows that my life revolves around Jay aka Mr Myasthenia Kid, Mollie, Frankie and Sewing. 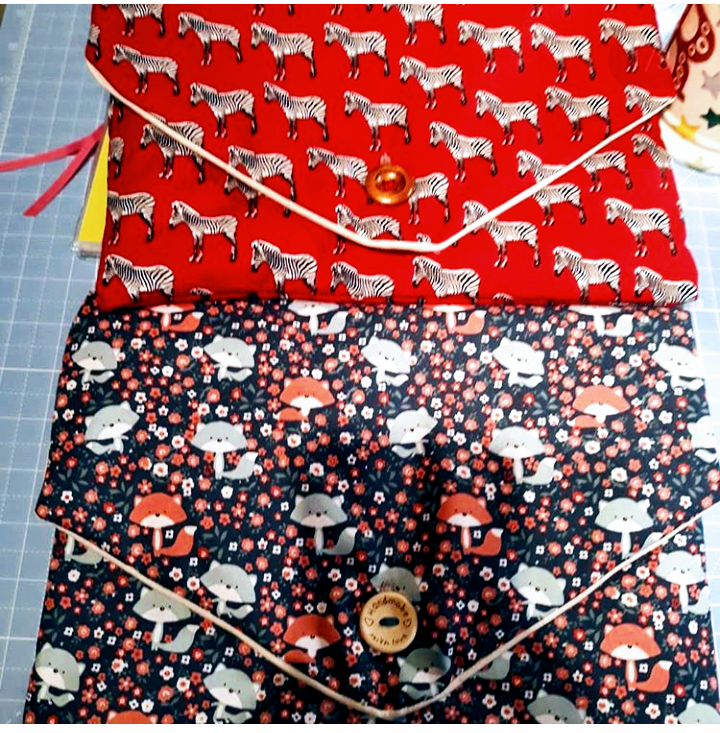 I live to sew, when I am not sewing I am planning my next project. So for me to suddenly become frightened of my machine, was just bizarre. I can’t tell you exactly what it was that was frightening me but I just felt like a complete failure and that nothing I did was good enough…….a great pretender. Dresden Plate design cushion cover in the newly launched Liberty Quilting weight range of fabrics. I was so proud of it I posted it on the Sewing Quarter Fans page on Facebook. My Cushion was mentioned by Jenni Smith who works for Liberty of London on their fabrics. I was so chuffed, it has given me some confidence back again. 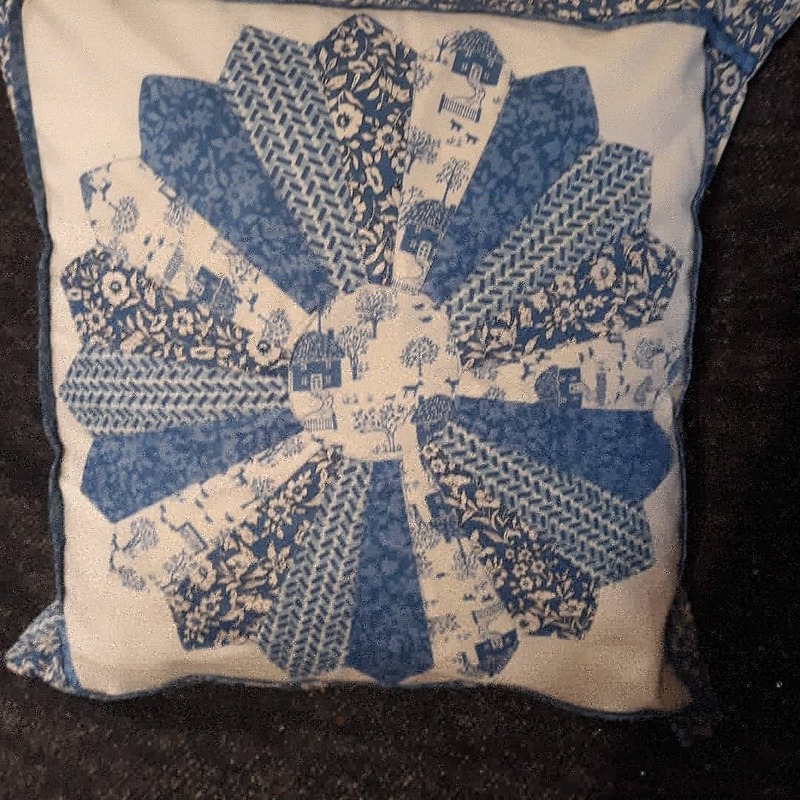 So much so that I made another Dresden Plate cushion cover design on the Sunday. So I am hoping that things just continue to improve now. I still get anxious, I always will but I no longer feel like I have to pretend that everything is ok. I (well we, me and Jay) have suffered a huge loss in a short amount of time and it’s ok not to be ok sometimes. You don’t have to pretend that everything is going well. My plan to tell you more about our visit to Sewing Quarter HQ in Birmingham has had t be put on hold. Over the weekend we had more snow and on Monday morning our boiler stopped working. In an effort to get it working again, I tried defrosting the condenser waste pipe in case that had frozen. Unfortunately on around the 7th trip out of the back door the snow and ice got me. I ended up falling badly and hitting my head on the doorstep. I probably had a mild concussion, I was left very upset for the rest of the day. I kept bursting into tears which I hate doing. Yesterday (Tuesday) I was in agony with my legs where I had fallen very hard onto patio slabs. Today (Wednesday) I am still quite sore but I am having to sort the house out as we (fingers crossed) are having a plumber out to look at the boiler. We’ve been given the run around by two plumbers, countless others are apologising as they just can’t get to us as obviously the cold weather has sparked lots of boilers to misbehave and this is on top of their normal work load. We are lucky in the fact we live in a small house so a little halogen heater is making the world of difference and we have an electric shower so we aren’t reliant on the boiler to wash. It’s just a massive pain in the arse and just another thing for my anxiety to take hold of and keep me awake for hours. The fall has left me feeling very vulnerable, I could have knocked myself unconscious and no one would have known I was there. I hadn’t even taken my mobile phone as I was going 4 steps from the back door. I am still really sore and just fed up with it all. Hence why I can’t give you a decent post which would follow up on our visit. Hopefully next week, if things have gone a little smoother…..for a change. For around a month Mr Myasthenia Kid aka Jay and I have had to keep an enormous secret, I won’t lie it’s been incredibly difficult. Some of the first people I wanted to tell were you my blog followers. We had been sworn to secrecy and we didn’t want to jeopardise it, so as best we could we kept the news to a smallish group of people. However now the secret is out and I can share it with you. In the UK there is a channel called the Sewing Quarter, you can check them out on YouTube as the 4 hour show is downloaded daily. Jay and I have been watching it since it started being broadcast by Sky Television in January this year. The channel sells fabric, sewing machines, quilting accessories anything really to do with sewing by machine or hand. It also however has excellent hints and tips for people of all abilities and I have learnt loads from watching the show, much more than I could have done by reading books as you have things demonstrated in front of you. The main reason I think a lot of viewers watch though is due to the main presenters John Scott and Natasha McCarty, both have very different presentation styles but they are equally enjoyable to watch. They also have a guests on that demonstrate the items that the channel is selling that day. It is after all a channel that exists to sell products, it has no outside advertising so to exist it must make money, that is the way of the world. Back in January Jay and I were decorating the lounge and whilst we were doing that we had the sewing channel on as it was their birthday week. They had lots of special offers, competitions and a sew off between Natasha and John – hilarious. Well whilst we were painting Jay must have been listening quite intently to John, as a few weeks later I was sewing in the kitchen and jay piped up “ As Rachel is finishing off her Easter wreath, I will take you through todays bundles”. I had to stop sewing I was laughing so hard. I mentioned it on the Sewing Quarter fan page and people started asking for a video. I posted something along the lines of if John Scott mentions Jay on the show then he will do a video. So this happened – sorry for the poor quality of the sound and shaky camera work, I have recorded it using my phone straight off the TV. We were mentioned a few more times during this week, much to our delight so on the Sunday Jamie decided he would do his first video. It went down exceptionally well with the fans of the show, to be honest it went a bit crazy! Later than evening whilst I was in bed Jay came rushing in to tell me the head honcho at the channel Neil Garratt had sent him a message on Facebook and what should he do. You see Jay is not brilliantly tech savvy, he can operate Facebook but he had no idea he would have to accept a message to be able to respond to it etc. I was in shock and looked at his phone to see that indeed Neil had messaged him. I accepted the message and then handed the phone back to Jay to let him read it. It said that they wanted Jay on the show to be alongside John and that we had to keep it quiet as they wanted it to be a surprise for the fans. Jay had to email him and one of the members of staff form the show would be in touch with us. Within a few days it was all set in motion that Jay and I would travel to Birmingham and visit Sewing Quarter HQ and that Jay would be on air on 12th March. It was all very exciting but oh so difficult to arrange and keep a secret. Especially when Jay had to organise time off work and I had to organise a dog sitter for Mollie and Frankie. Hayley the lovely lady that we were working with offered us a hotel room for the Sunday night but as we had never left the dogs overnight before ( and they are old doggies now) we didn’t feel comfortable doing that. We decided we would travel up that day and do it all in one as we had when we went to the Emma Bridgewater Factory in October last year. When Jay did the first video and I posted it onto the Sewing Quarter Fans Page on Facebook people had asked for more. Even people who had never seen the Sewing Quarter but were friends with us on Social Media asked for more when I posted the video to my Facebook timeline and Instagram. So to keep Jay relevant and the fans happy, we recorded another video, plus we had been mentioned a few times on the show by John Scott ( which we always got an enormous kick out of). The second video went down as well as the first, which was a huge relief! My planning and organising went into military operation mode, my anxiety has been up through the roof since suffering a series of bereavements at the beginning of the year / end of last year. My need to control everything as much as possible was in overdrive. I am sure Jamie must have got sick to death of my ever-growing to do list that seemed to cover every minute aspect of our lives! New shirts for Jamie had to be bought as John is famous for his flamboyant shirts, Jay couldn’t appear in his usual conservative style. Thankfully my best mate from primary school Sharon, offered to look after the dogs as soon as I told her what had happened. She like everyone else that knew what was happening said it was about time that we had something nice happen after all we had been through. Ellie offered us a car to use should something happen to ours, she also said she would be available to assist Sharon should she need any help. So many people offered us so much help and support it really was amazing. The time between knowing that we were travelling to Birmingham and getting there seemed to at the same time to pass very slowly but also very quickly. It was so exciting but the excitement was stopping me from sleeping. From Monday night onwards this week I have been out for the count before 7.30pm. I am totally exhausted and in a lot of pain but it has been worth it. When this one went up, so many of our friends and people on the fans site were saying “when will they be on the show together?” and that kind of thing. I just kept saying nothing that would give the game away, although it was getting harder and harder to keep this secret. I will admit on Friday last week I did message a few people and let them know that Jay was going to be on the show. People were beside themselves with excitement and were so happy for us. It was really lovely to know that all these people were delighted for us. There is so much more I could tell you, I will probably expand more on the experience in next weeks blog post but I am aware this post is already getting quite wordy and its been the most I have written in ages! We would both like to say a massive thank you to everyone at the Sewing Quarter HQ, especially Hayley Marshallsay, John Scott and Deborah Simms. Snow is a big deal in the south-west of England, purely because it happens so rarely. I have lived in Exmouth 22 years and have only seen it three times. On those three occasions it was worse than any of the forecasters had predicted. This time there was a red weather warning over Exeter, which Exmouth is very close to (for those of you elsewhere in the UK or overseas). Everyone was pretty blase about the possibility of snow because it is just such a rarity. 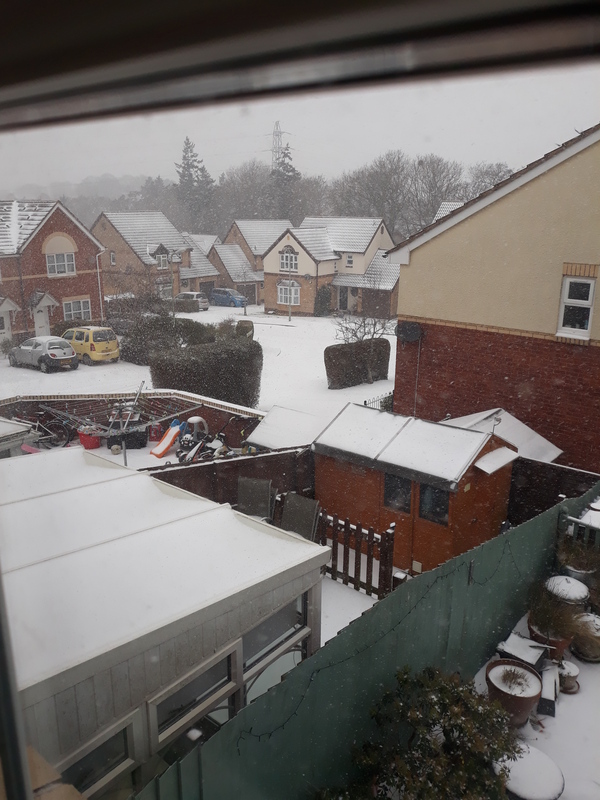 However I follow a local weather group South West Storm Chasers and I have to say their forecasts are very accurate and when they started saying that “yes Exmouth would get snow” I started to listen. On the Wednesday of last week we had a few very light snow showers, whilst other places in Devon got quite a bit more snow. However on Wednesday night it was clear from all the forecasts it was going to be Thursday that the weather would be at its worst. Hubby was sceptical, but when we woke up to snow on Thursday morning and it didn’t stop snowing, he started to take notice. Hubby was working a middle shift so I managed to convince him to leave the car at home and just walk in. At that point around 9am there wasn’t a lot of snow but within a few hours the situation was completely different. 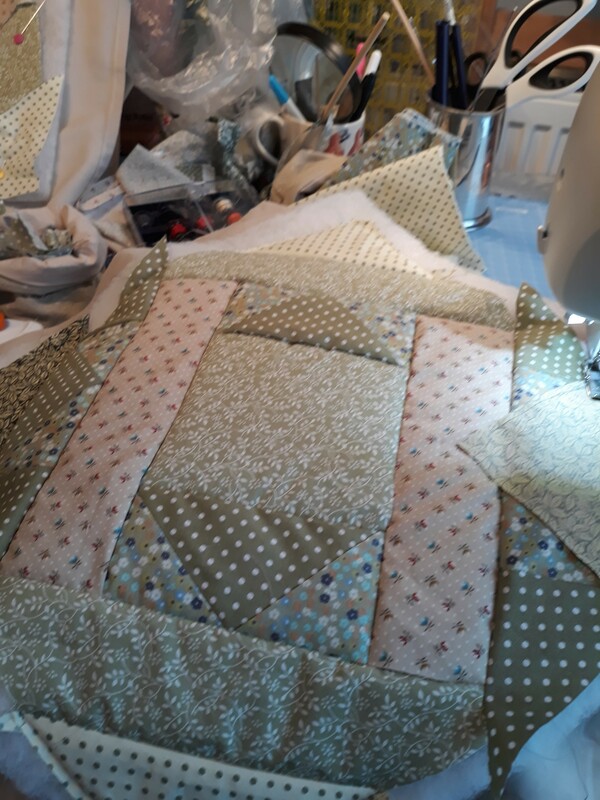 I was sat at my sewing machine in the kitchen with the local BBC radio station on listening to the reports on road closures and school closures. 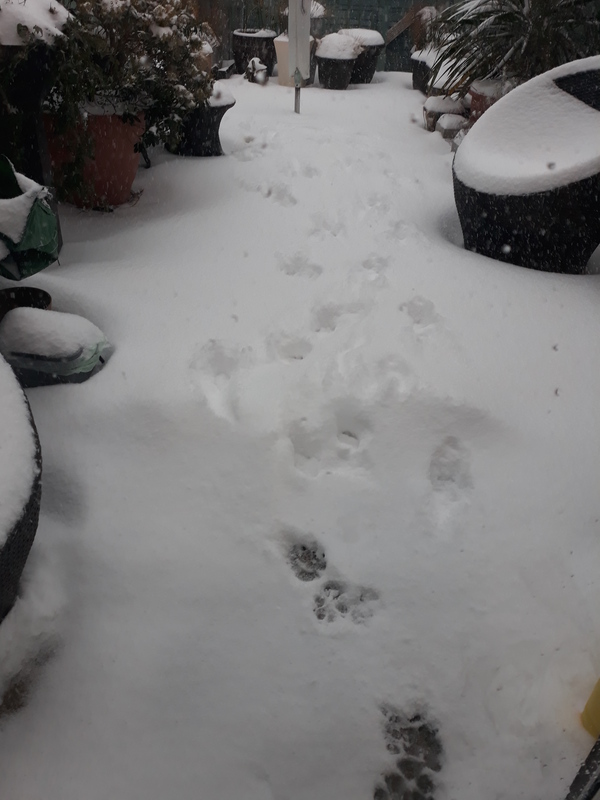 Each hour I was sending hubby photographs of the back garden as it was getting covered in more and more snow. 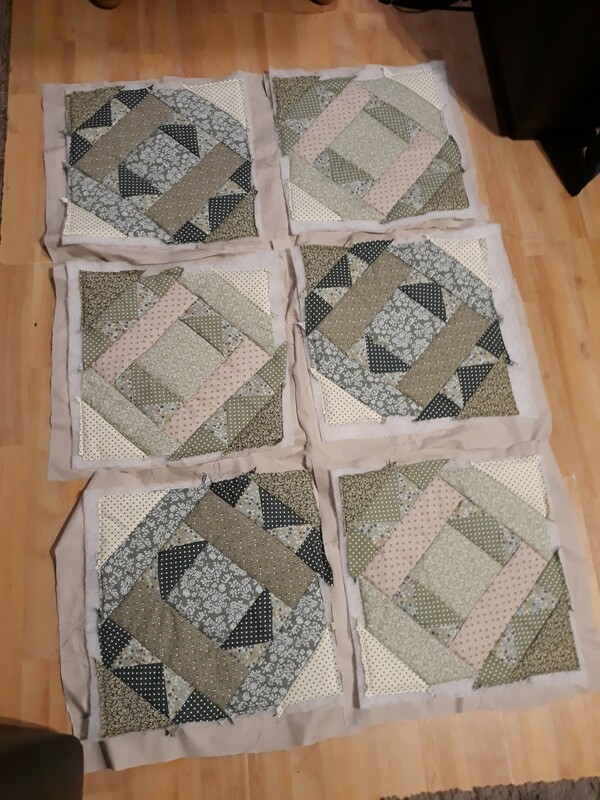 I was quite happy though as I just sat at my sewing machine and finished off the panels of my first quilt as you go quilt. I have just got to now sash the panels together, which I will do over the next few weeks. I am trying to decide if I will add both my quilt as you go quilt panels together or have them as two separate ones. My second quilt I sewed in one day on the Friday, as once I knew what I was doing I could whizz through it. When Hubby got home at around 6pm on Thursday evening it was still snowing and when we went to bed at around 8pm it was still going. Overnight we had freezing rain, which is a very weird one. 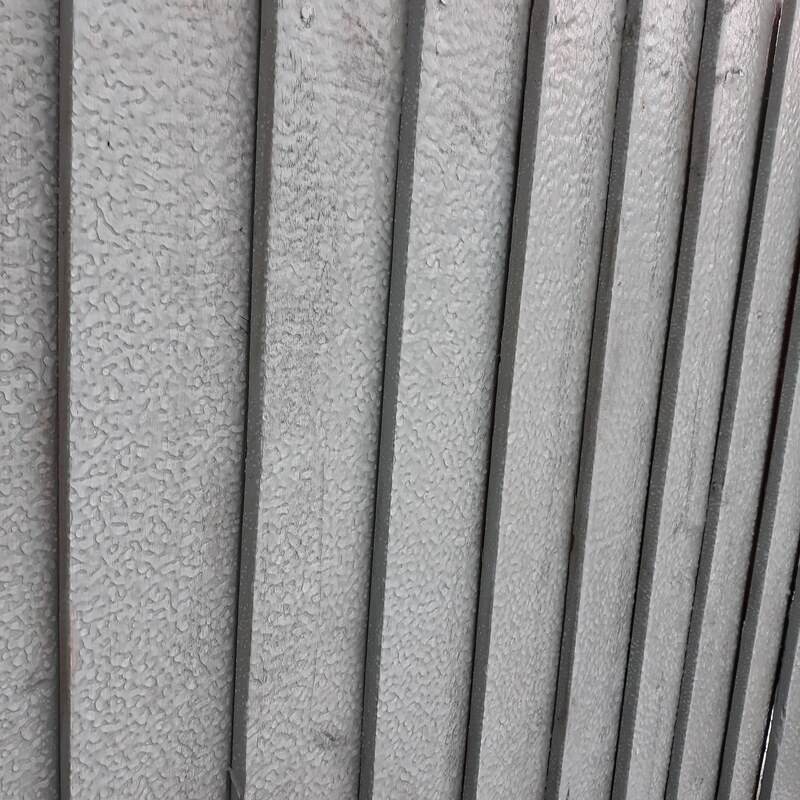 It falls as normal rain but on contact with any surface it instantly freezes. It leaves the most bizarre patterns on things. What it also did was leave a thick crust of ice all over the snow that had fallen the day before. When walking on it, it was so loud like you were walking on gravel. The dogs hated it, Mollie couldn’t get back to the house quickly enough when out for a walk and really missed her daily jaunts to Woodbury Common. 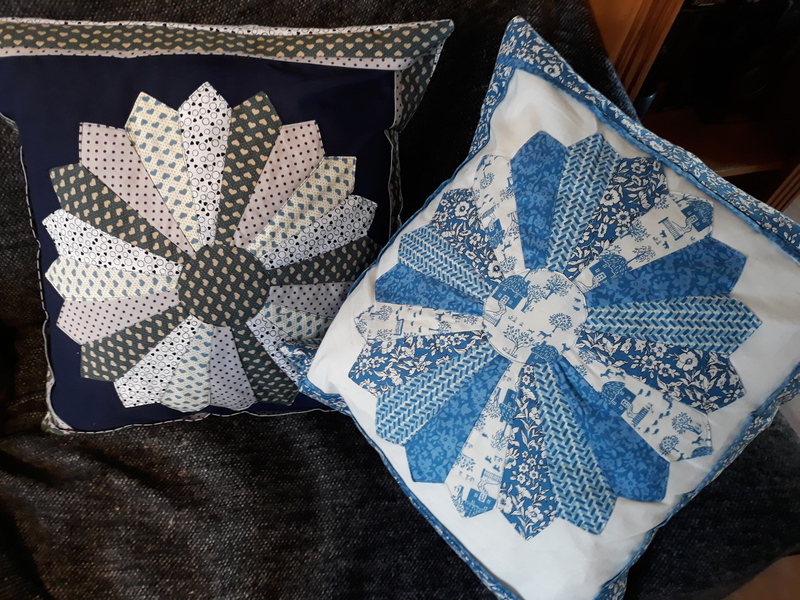 During Friday we had more snow, so again I sat in the kitchen at the sewing machine whilst listening to the radio, I couldn’t believe it when I completed the second quilt as you go (qayg) from start to finish in one day. 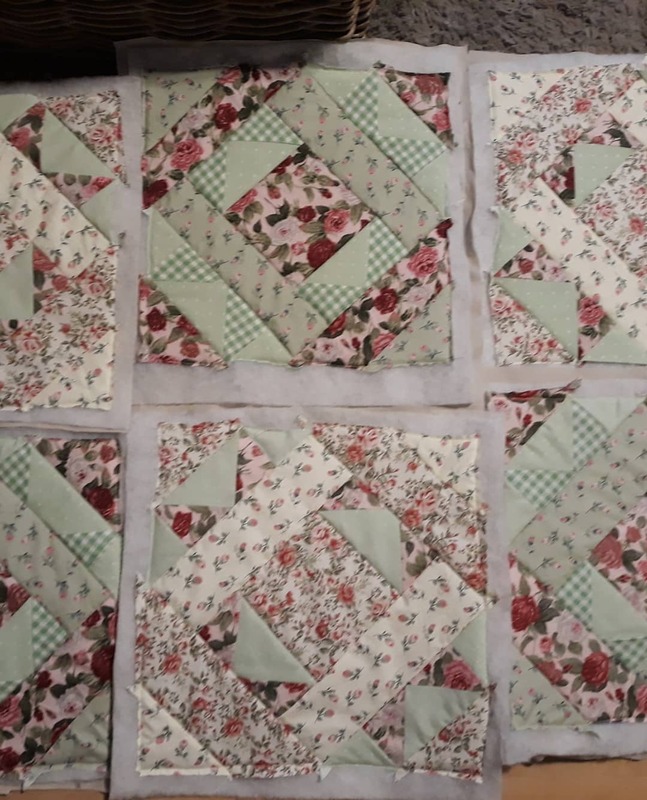 This included cutting 44 , 2 ⅝ inch squares for the six panels. As this quilt was the same as the first one I whizzed through it as I knew exactly what I was doing. The snow was short-lived on Friday night the rain started and that continues all day Saturday. By 2pm all the snow was gone from our garden and traffic was moving again. 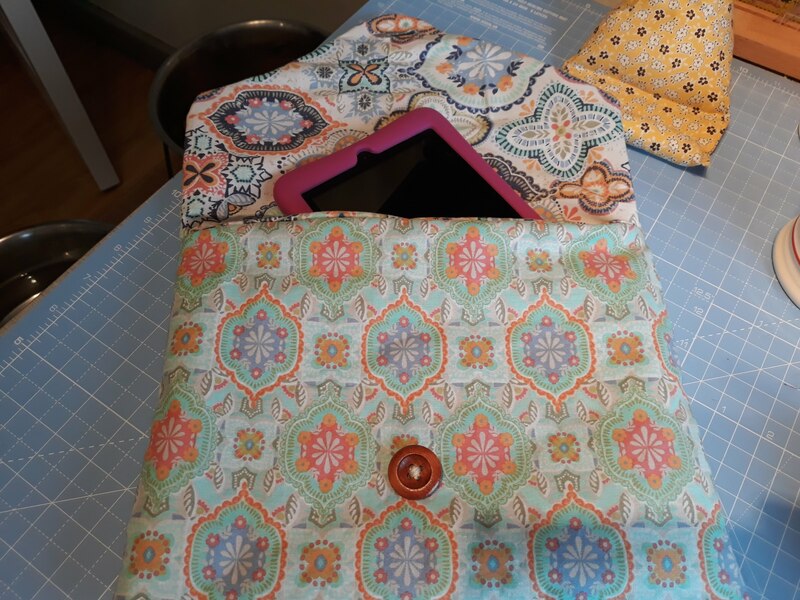 On Sunday afternoon I decided to make my best mate a ipad bag and myself a clutch purse ( same bags just different purposes). With these I made them from fabrics I had bought in the sale at Christmas. However these both had directional patterns on them so I had to solve the issue of having the patterns facing the right way on the back and then on the flap at the front. 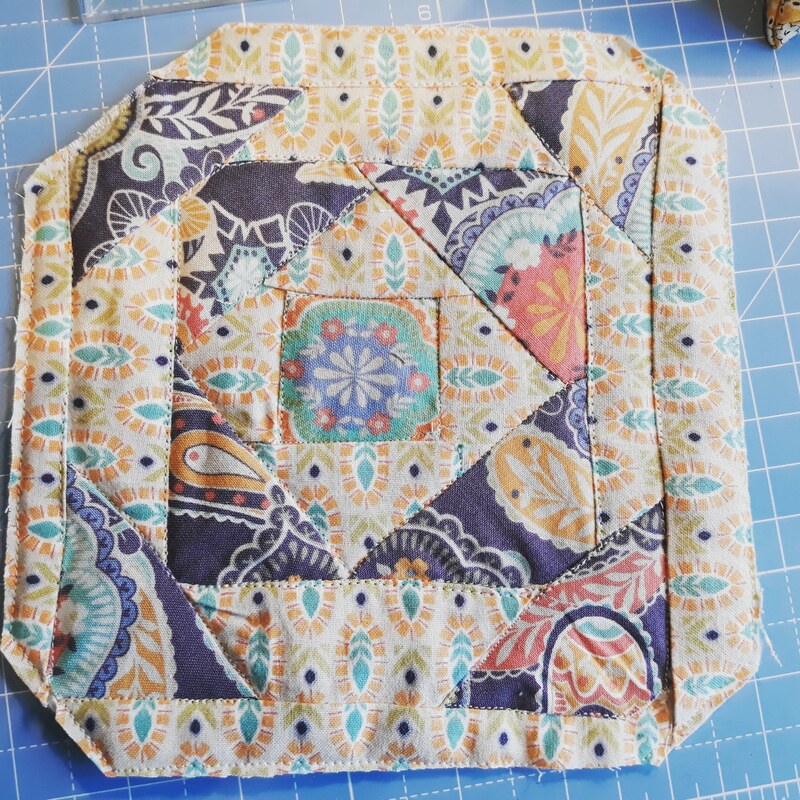 I solved this by cutting out the back panel, then cutting it in half, turning one pattern completely around so the print faced in the opposite direction and then sewed the two pieces back together again. If I hadn’t done that the zebras and foxes would have been upside down on the flap. I was so proud of myself for working out how to solve this problem. Mine is the red with the zebras and my friends is the one with the foxes. Next week I will have lots of exciting news for you nut at the moment I am having to keep an enormous secret. Its killing me keeping it from you all but you will love it when you hear it. And to put you all out of your misery I am NOT pregnant! This week has been a bit up and down health wise and emotionally. For a few days out of the last week my back has been exceptionally painful, with no position be it standing, sitting or lying providing any comfort. Insomnia was back with avengence resulting in me ordering a new fridge freezer at 5am on Friday morning having been awake since 3am. Saturday I was struggling to breathe a problem I haven’t had properly in years. Eventually after the second dose of mestinon it eased but for a while there I was fully expecting a trip to hospital. I have been waiting for my health to take a nosedive, you can’t be through the sheer amount of losses Jay (Mr Myasthenia Kid) and I have through December and January and walk away unscathed. Jay had to see his consultant dermatologist this week as he suffers with Psoriasis. In his follow up letter it stated his Psoriasis was flaring up due to “ major life events” it was only then when I saw that it black and white that I even began to acknowledge that what we have just been through isn’t normal and isn’t just one of those things. I excused myself for having a bad day last Thursday and spending most of it in tears. I accidentally called Frankie, Willow. His face lit up like Willow was going to walk through the door at any minute and my heart broke all over again. I hated the fact I had lifted his hopes up, when she will never be coming home. 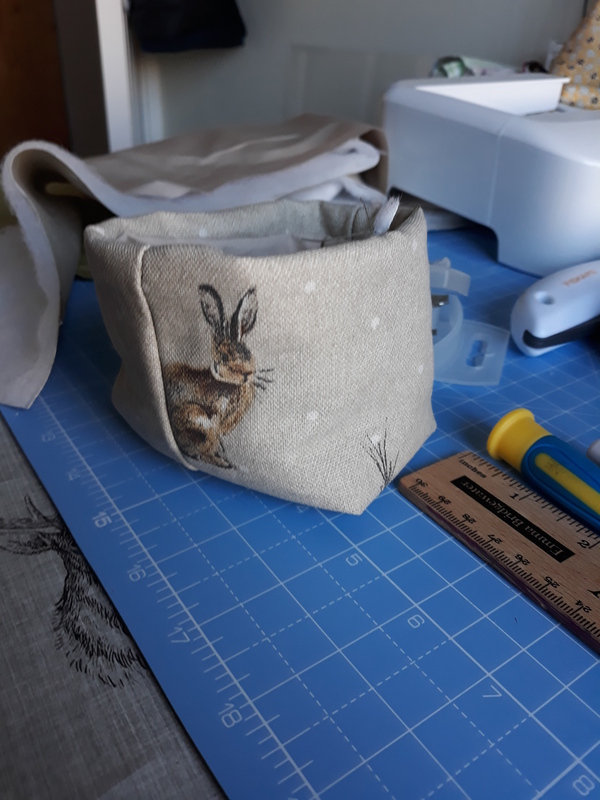 So due to all the emotional fallout of the last week and not being particularly well things have been quite slow on the sewing front. I have had a couple of days where I haven’t sewn at all. I won’t lie I am struggling a bit under the weight of it all. However there are some exciting things happening in the future which I have to keep under wraps at the moment. As soon as I can share I will. Phone stand and Glasses case. Thread catchers and fabric storage canisters. This was my first attempt at using my creative grids pineapple trim tool. For those of you who don’t know about quilting each style of quilt has a different name. This is a pineapple block, it needs a lot of work!